GECCU (the General Employees Cooperative Credit Union) formed nearly 42 years ago, has established itself as the leading credit union in St. Vincent and the Grenadines. They have attained that position through a process of mutual respect between staff and members. That confidence was manifested with the acquisition of the $100 million and over 20,000 members landmark observed in a special ceremony last week Tuesday. It was at that function that the case of 15-year-old Elecia Wickham was highlighted. 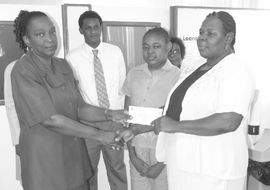 Elecia, a student of the Bishop’s College Kingstown, has been diagnosed with a renal problem. She is in “dire need of a kidney transplant” as outlined by GECCU’s Administrative Assistant Cornelia Moses. But GECCU has undertaken the task of securing the approximately US$40,000 needed for the operation. President Angela Martin exuded confidence that they will meet their goal when she spoke at a brief ceremony at GECCU’s headquarters last Monday afternoon. The function saw the setting up of the Elecia Wickham Appeal Fund. GECCU initiated the venture with $1,500. For Martin, gestures like this to assist needy persons come as fulfillment of the institution’s social responsibility. “Gestures like this help others to see the tangible and intangible qualities that make GECCU unique,” Martin said. Elecia’s mother Mathilda Wickham expressed gratitude to GECCU’s staff. She outlined that Elecia was in “capable hands” once GECCU became involved.